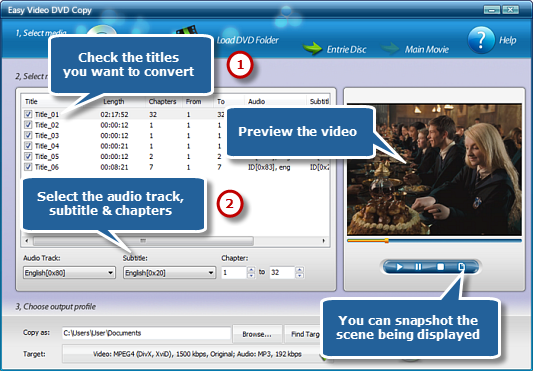 Easy Video DVD Copy brings users a totally free DVD to MPEG conversion solution. 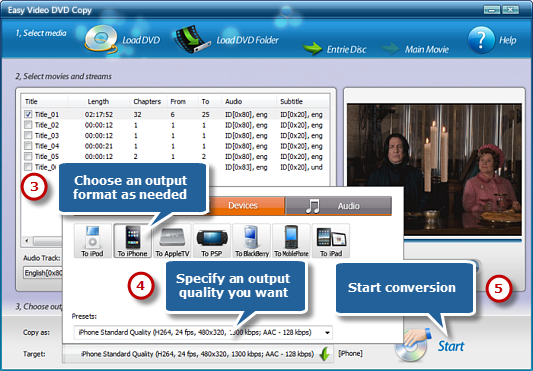 It lets you rest assured that all kinds of DVDs can be flawlessly compressed and converted to high quality MPEG video. Back up DVD to hard drive as MPEG video file and playing DVD with Windows media player will be as easy as rolling off a log. Also MPEG 1 and 2 can be used to create Video CD and Super Video CD. Click “Browse…” to choose an output directory to save the converted videos. Activate the “Target” menu and it will display 3 tabs for output formats: Video, Devices & Audio. Choose “To MPEG” from “Video” tab. For specific needs, you can adjust the output quality with the well-configured presets for every format in the “Preset” dropdown list. Then, click “Start” to start conversion.